An artist's depiction of the star TRAPPIST-1 and its seven planets, several of which may be able to hold liquid water on their surfaces. Our sun shapes every day of our lives and always has — and if there's life on alien worlds, the same will be true of their stars. That means that for scientists hoping to determine whether there's life elsewhere in the universe, it's crucial for them to know more about both exoplanets and the stars they orbit. One such scientist hopes that big data will be able to help her and her colleagues narrow down the most plausible homes of life, and she has built a database to coordinate that effort by pulling together information about the different factors that affect how habitable a planet is. 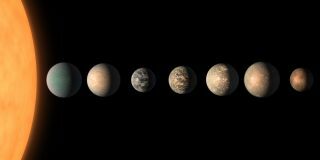 "At first scientists focused on temperatures, looking for exoplanets in the 'Goldilocks zone' — neither too close, nor too far from the star, where liquid water could exist," Natalie Hinkel, a planetary astrophysicist at the Southwest Research Institute, said in a statement issued by the institute. "But the definition of habitability is evolving beyond liquid water and a cozy temperature." In particular, scientists have begun to consider a planet's chemical composition, since life as we know it relies on elements like hydrogen, carbon, oxygen, phosphorus, nitrogen, iron and silicon. Scientists don't yet have the technology required to measure planetary composition directly. But they can measure the ingredient mix of a star and use that as a stand-in for the planet's recipe, another reason why gathering data about stars is just as important as gathering data about planets. She is also working on developing machine-learning techniques to figure out how stellar and planetary compositions may affect each other.